Spey casting double tapered lines. Double tapered lines for salmon and steelhead. Double taper Spey lines for small rivers. Much less commonly used nowadays double taper lines were used for around 100 years as the mainstay of the salmon fly fisher and they proved to be (and continue to be) excellent fishing lines with certain advantages over some of the modern types. 3M Scientific Anglers and Cortland are the brands which I have mostly used. As a financially challenged University student I bought a second hand DT9f/s Aircel line and it remained in fishable condition for 40 plus years. Certainly it was not used many times each year and it was kept clean and well maintained, nevertheless this shows that buying a top quality line can save you money in the long run. Double tapered lines are less easy to cast distances greater than 80 feet than the other types because they shoot line less easily but where the maximum casting distance of 75 feet is sufficient such as on small or medium sized rivers double taper lines offer hassle free fishing and allow mends to be made very easily at almost any distance. A huge number of salmon and steelhead are caught each year at casting distances of less than 75 feet. If truth be told probably many more than are caught at longer range. That does not mean that longer distances are not possible and indeed for many years 40 yard DT lines were used to their full extent on larger rivers by the most skilful of anglers. 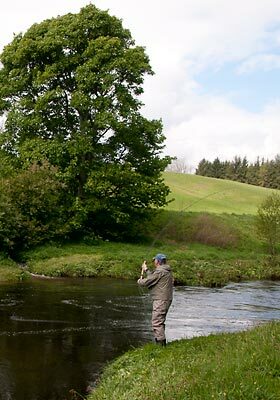 Therefore if you fish small rivers you may elect to ignore all the publicity hype that surrounds weight forward Spey lines and shooting heads and prefer to use an old fashioned totally reliable and well proven double tapered line which with normal use may be reversed to double its working life. Unfortunately the choice of sink rates and sink tip densities available is limited due to the lack of demand for this profile nowadays yet for many rivers and lochs they are perfectly adequate.